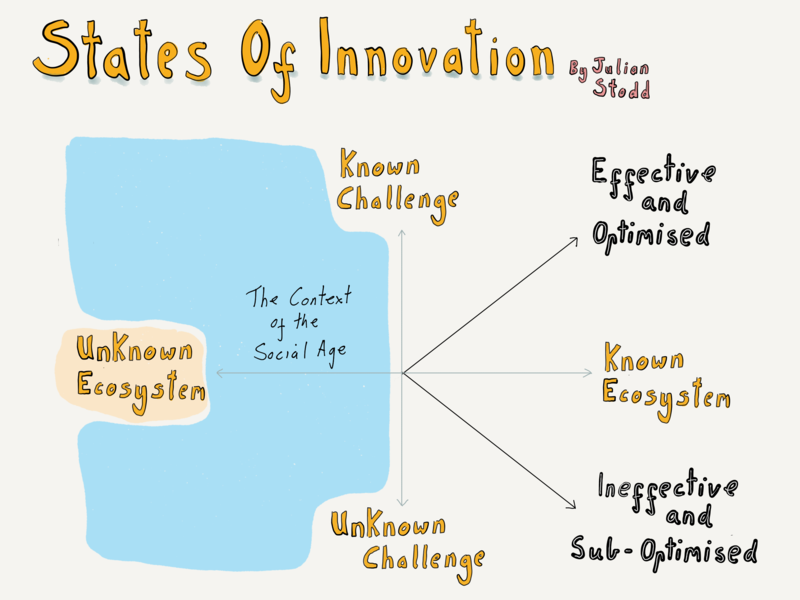 I’m grounding my new work around Innovation in two frameworks: ‘States of Innovation’, and ‘Cultural Agility’. 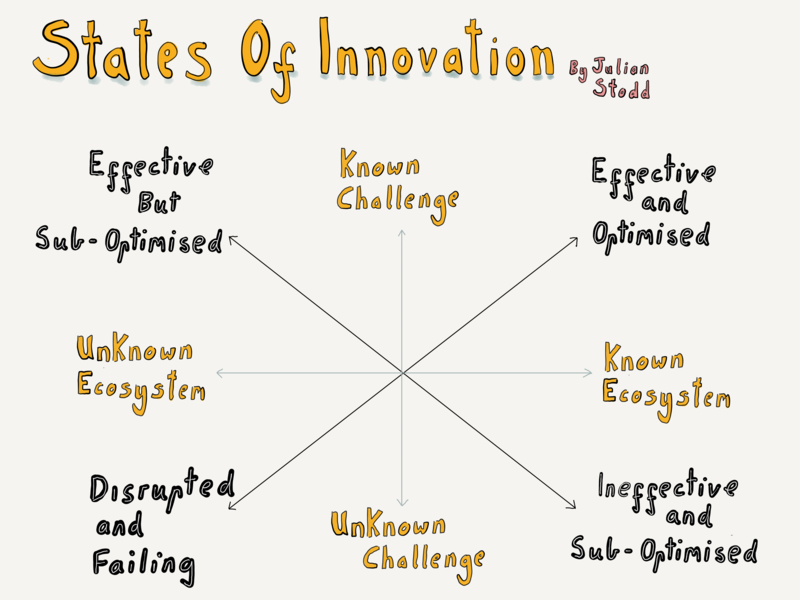 Today, i want to explore States of Innovation further, a model which uses a grid to explore the current state in relation to two dimensions: the context of change, and the nature of disruption. The horizontal axis describes the context of change, ranging from ‘known state’ (the world as it used to be) into an unknown state (the world as it is today, the context of the Social Age). Broadly, this axis charts how Organisations are slipping out of their known world, and into the largely unknown one, but crucially it distinguishes between ‘change in a known space’, and ‘change in an unknown one’. I’ll come back to this in a minute. The vertical axis describes the nature of change, or more specifically, the nature of disruption. This axis is most heavily influenced by my own work on Black Swans and the limits of formal systems, as well as broader notions of a VUCA world (and stands in debt to Nassim Nicholas Taleb’s work in particular on Black Swans: my work is a pale shadow of his). When we combine both axes, we have two frames of change: the ecosystem, and the nature of disruption itself. The black text in the four corners describes outcomes, ranging from perfectly adapted, through to failed, and it’s driven by understanding the things that organisations do well, within a known space, and those things that they do badly within that known space. Once a market emerges, people inhabit it (or perhaps, to be pedantic, perhaps when people make an offering within it, they create a market), but once established, much competition takes place within a known space. Banks typically compete within a known space, coffee shops do the same. So they are innovating, and out competing each other, but broadly within a known space. 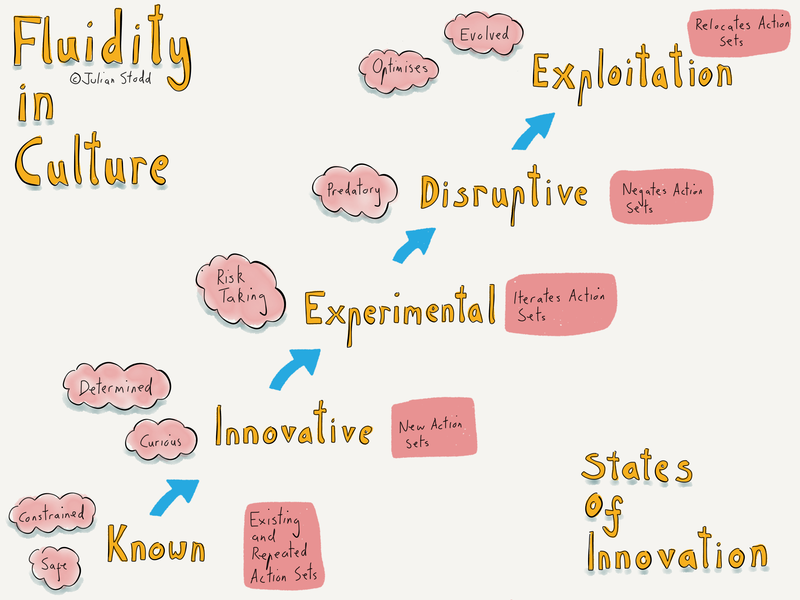 But disruption often (and probably increasingly) comes from outside that known space, for a range of reasons. Much of the context of the Social Age has democratised competition, removed structural barriers of power, democratised communication, collaboration, and the mechanisms of innovation (prototyping, design, marketing etc) essentially making it easier to enter a market, or innovate a new one. Collectively, this weakens the bedrock that sits underneath an established organisation. Whilst all of this is happening, Organisations do what they do best: they codify their strength, they drive for consistency, conformity, replicability. They drive down costs, outsource, and accrete strong hierarchies that allow them to control diverse resource. They build strength, but a very particular type of strength. 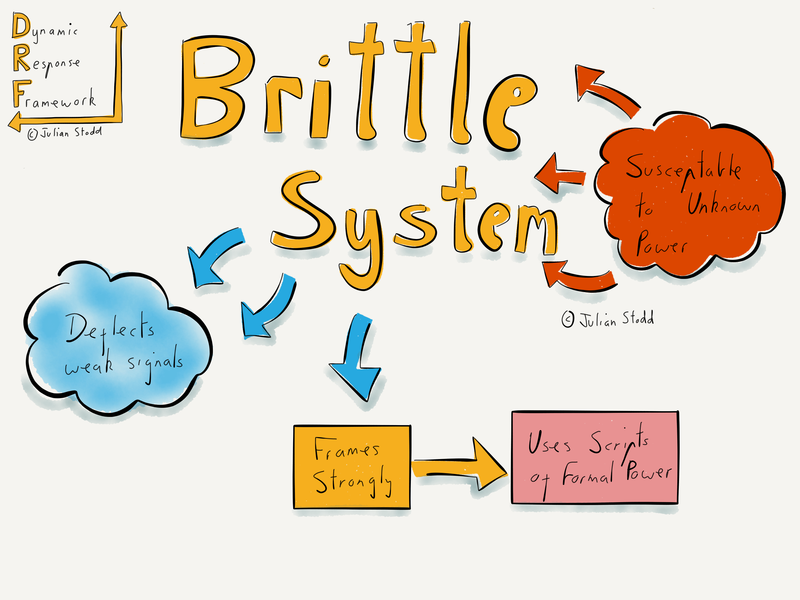 They become Brittle Systems. Optimised organisations inhabit the top right quadrant, and to be clear, they are excellent organisations, filled with the brightest people, at a peak of their success. But what if the context of their success, and the nature of their disruption, is evolving? That’s where we end up: drifting to the left, or drifting downwards. I suspect that many organisations are moving to the left in particular: they have great codified strength, and hence momentum, and they are often large, and wealthy. They don’t notice the increased friction that drags on almost every aspect of what they do. They are actively sub optimised in a changing world. Formal change programmes, strong formal leadership, and established formal models of learning, performance support, induction, and assessment, all hold them in the known space. But the known space is an illusion, a transient reality that is fading fast. Our legacy organisations were built with a codified strength, in a known world: for the new world, where change is constant, power is rebalanced, and engagement is evolved, we will need a new type of organisation, a Socially Dynamic one. Best of the old, and best of the new. But crucially, one that does not ground it’s strength in mass, but rather in interconnectivity, in community. 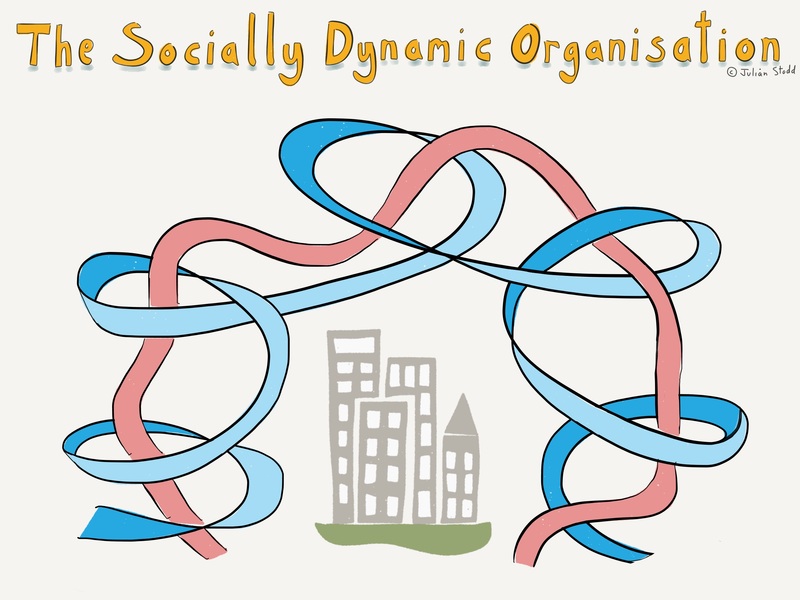 The strength of the Socially Dynamic Organisation does not come from system and process, it comes from engaged and interconnected people. 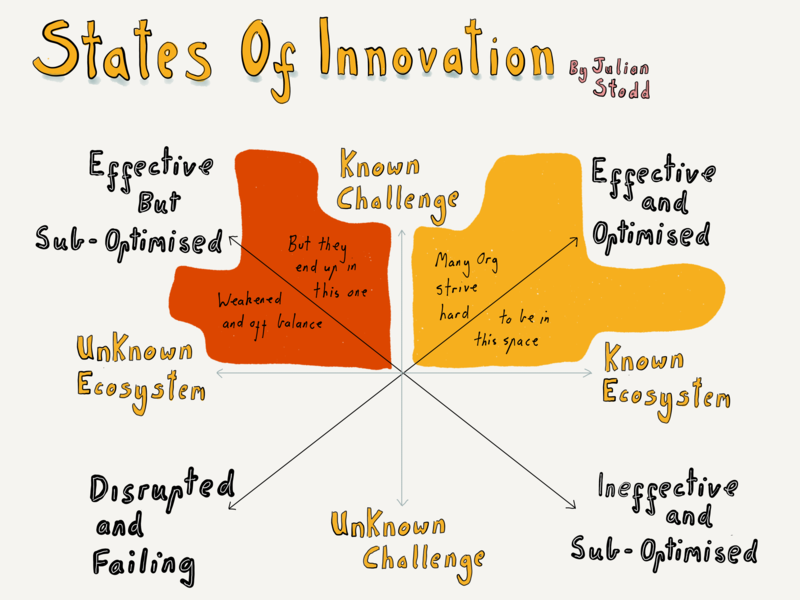 I’m using the States of Innovation framework to help organisations understand that much of what they experience is a subset of the whole truth. We operate within, and are hence blinded by, the ‘known knowns’, and the familiar world in which they take place. But we are increasingly assailed by unknown unknowns, and, worse, exist in structures of power that don’t understand the new reality and are unable to engage in it fully because the type of power they wield is wrong. From here, i tie into the work on Cultural Agility, which looks at the types of culture that an organisation needs (possibly multiple concurrent types), and also, of course, to Social Leadership, and the Dynamic Change framework. 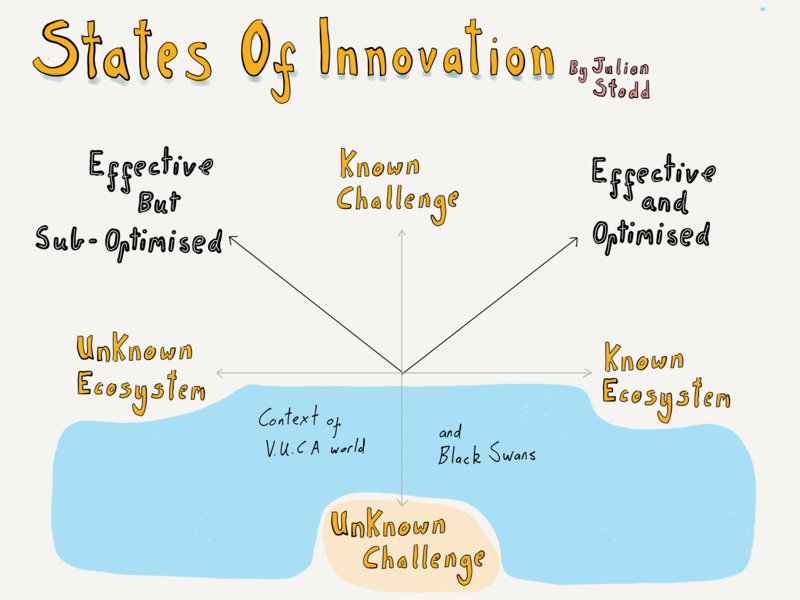 This entry was posted in Innovation and tagged Agile, Agility, Black Swans, Change, Failure, Innovation, Leadership, Social Leadership, VUCA. Bookmark the permalink.